The Pnyx is a small, 110 m. (360 ft.) high, rocky hill in Athens located less than 1 km (0.62 mi) west of the Acropolis and 1.6 km south-west of Syntagma Square, the center of Athens. This hill has served as a place of worship since prehistoric times and on top of it the ancient Athenians raised the Tribune of their Public Assembly following the abolition of royalty. The orator's bema, the podium at the Pnyx. Photograph by John Vellis. Mounting the upper terrace of this hill, one experiences a deep emotion at the thought that here, for the first time in history, the Rights of Man and the Liberty of Speech and the basic democratic principles were first practiced. This early assembly was the cradle of all legislative assemblies of Europe, and indeed the free world. Beginning as early as 507 BC, when the reforms of Cleisthenes transferred the political power to the people, Athenian citizens, the ekklesia, gathered here to host their popular assemblies, thus making the hill one of the earliest and most important sites in the creation of democracy. At the time, the location was outside the city proper, but close enough to be convenient. It looks down on the ancient Agora, which was the commercial and social center of the city. It is at the Pnyx, at this site, that all the great political struggles of Athens of the "Golden Age" were given. Famous orators such as Pericles, Aristides and Alcibiades spoke here, within sight of the Parthenon, the temple of Athena on the Acropolis, at the vema or bema, the "stepping stone" or speakers' platform, about 3 m. (10 ft.) above the ground, surrounded by a balustrade as it is attested by holes in the bedding. It is here that Demosthenes delivered his vilification speeches on Philip the Macedon, the famous Philippics, warning the Athenians about the expansionist aspirations of the Macedonian Greek state towards the South. In front of the bema, on the supporting wall to the North, Meton, the celebrated astronomer, established in 433 BC the Heliotropion (sundial). 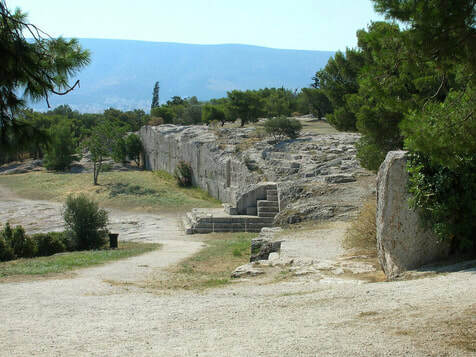 - The first phase was probably constructed in the early 5th century, associated with the changes of Kleisthenes. The people apparently sat on the hillside facing a speaker's platform on the north. There were wooden seats for the members of the Council of 500, who were selected by lot for terms of a single year to run the city on a day-to-day basis, and prepare the agenda for the Assembly. The seating capacity may have been anywhere from 6000 to 13,000 people while there was room for several more standing, and the assembled citizens had a view toward the Agora, The Areos Pagos and the Acropolis Propylaea. This phase is represented archaeologically only by a few cuttings in the bedrock and a boundary stone, not found on the site, so the date and size are not certain. ​- The second phase is dated ca. 400 B.C. A stepped terrace wall was created on the north to support an artificial terrace, and the people sat facing a speaker's platform on the south. Part of the stepped terrace wall is preserved, as well as a staircase with rock-cut steps leading up to it from the direction of the Agora. The size of the auditorium is not that much larger than the previous one. - The third phase, where the Pnyx was rebuilt and expanded probably around 345-335 B.C. A new monumental retaining wall with a stepped entrance gave new dimensions to the site. 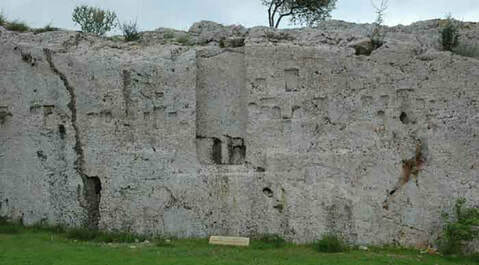 The southern side of the auditorium and speaker's platform (bema) were quarried out of the natural bedrock, opposite the entrance. French President Emmanuel Macron at Pnyx. A few months ago, Athens was host to a visit by the President of the Republic of France and Mme Emmanuel Macron along with top executives from 40 big French companies interested in investments in Greece. The French President left everybody with the best impressions, and renewed the traditional warm relations between France and Greece, two traditional allies and founders of the principles of democracy. 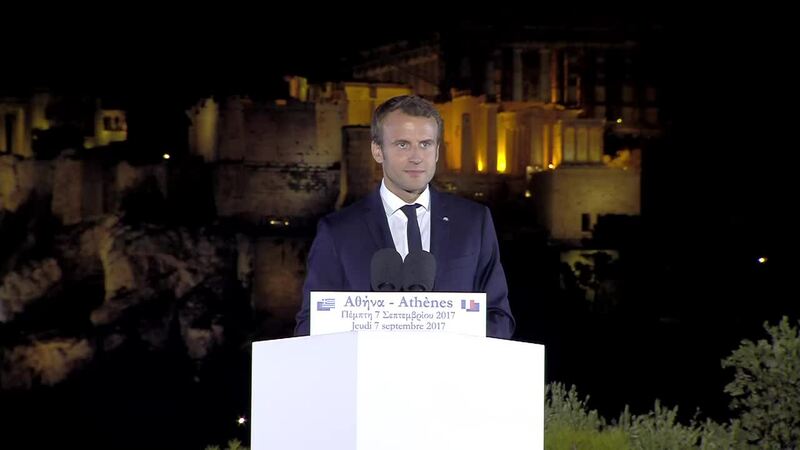 The President's speech on the ancient historic setting of the hill of Pnyx, with the backdrop of Acropolis was most memorable! The Sanctuary of Zeus Hypsistos. Archaeological excavations discovered the foundations of several buildings at and around the Pnyx, although nothing else remains of them. Most of these buildings were erected after the Pnyx had lost its real significance. These included the two large stoas, erected between 330 and 326 BC, the Altar of Zeus Agoraios, protector of the constitution, erected at the same time, but removed during the reign of Augustus (first century BC), and the Sanctuary of Zeus Hypsistos, as a healer. Evidence for the sanctuary consist of c. 50 niches for votive plaques cut into the bedrock scarp east of the speaker's platform. Many of the votive plaques are carved with representations of human body parts (eyes, breasts, etc. ), suggesting that this Zeus Hypsistos was a healing divinity. West to the Altar of Zeus are the foundations of Meton's heliotropion, the oldest known astronomical observatory, where Meton performed several of his measurements that led to the calculations involving the eponymous 19-year Metonic cycle which he introduced in 432 BC into the lunisolar Attic calendar, a calendar that appears in the Antikythera Mechanism. Close to Pnyx, for the independent minds, we suggest Acropolis Luxury Apartments. Just steps from the New Acropolis Museum, Acropolis Luxury Apartments are 400 m away from Herodeon, while Monastiraki Flea Market is only 700 m away. Modern apartments featuring a balcony or a terrace, offer views of the Acropolis and the city of Athens. Each apartment, with handpicked furniture and modern design, comes with a living room, a well-equipped kitchenette or kitchen and a private bathroom with free toiletries and a hairdryer. Facilities include A/C, free WiFi, flat-screen TV with CD/DVD player, microwave and dishwasher. The orator's bema, the podium at the Pnyx. 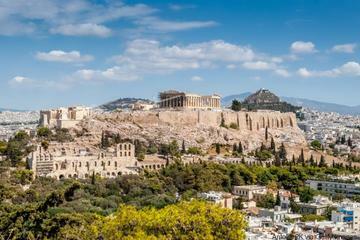 Explore Athens and follow the trail of the world’s first democracy.